Wow, Lucy! This is FABULOUS! Lucy, what a fun and creative card, love the way your mind thinks when you create, this is a gorgeous card. Beautiful - love this stamp, too! Love the crackle look, dimension and fun white highlights! Nicely done, Lucy! Love the crackled leaves. Gorgeous card Lucy using the pp. 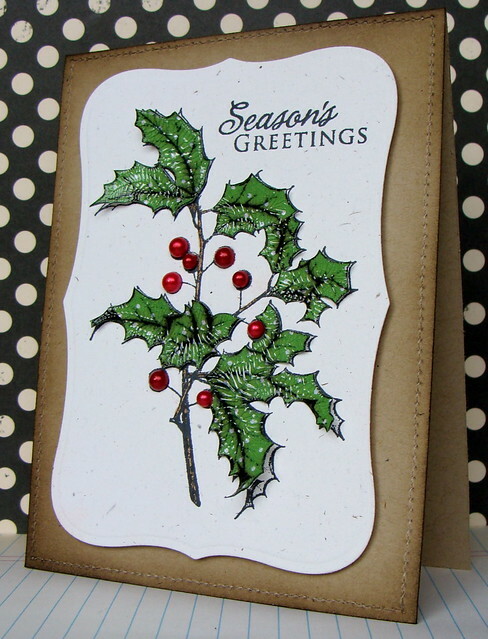 Have enjoyed your challenge cards Lucy, this one is fab, love the crackly holly. Off to check out the other two blogs! Beautiful and elegant. Love every little detail. Wow - gorgeous detaling. The crackle makes it look dewy. Oh Lucy, this is simply stunning. Adore it... love what you created. This stamp is now on my wish list having seen what you three ultra talented ladies have created with it.... stop the enabling!!! LOL!!!! The crackle adds so much to the leaves. Thank you for sharing your talent with us. Gorgeous card. I love those leaves, they are so cool. Wow wow wow. Masterpiece of a card, Lucy! 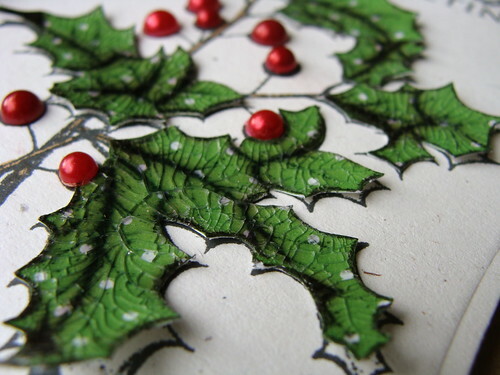 I love the crackle effect on the holly leaves too, but the genius to me was slightly curling them and mounting them on the uncolored stamped image...such a unique idea and so striking! Awesome work. This is such an amazing card! The paper piecing, the crackle sheen, etc. just add up to a beautiful card! This is of an incredible effect!!! I just worked with that stamp, too but my card doesn't look as this one! Gorgeous! Beautiful! Love the red pearls accenting the leaves! Love the crackly leaves and the yummy red pearls! Amazing! I never would have thought to make this crackly! I love all the texture! Stunning!! This is stunning, I love your red pearls--and the crackle looks like you've just had an ice storm. I guess I will have to get that stamp. Thanks for doing the challenge with Jennifer and Kathy, this is fun to see different ways to use a stamp. Such a fun card, Lucy! I love the way you added the pearls and the crackle. It looks amazing! Stunning - love all three cards. You guys rock!!!!! Love the crackling on the leaves! Stunning! The way you did the leaves is stunning. Nice! simply beautiful love the dimension and crackling effect.